Report Filters: Applied to a single report tab. They are similar to Query Filters but that you cannot prompt on them. Input Controls: A flexible way to allow end users to filter reports. Unlike Simple Filters, the look, feel, and operation of these filters can be customized. 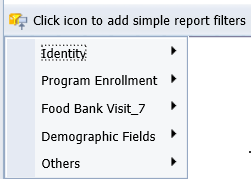 Input Controls can be applied to individual report pages or the whole document. 9. To remove the report filter, click the area where the filter is applied. Click Remove Filter or Remove All. -Values can appear as radio buttons, check boxes, a list, numbers on a sliding scale, etc. For more information on Report Filters, click here. Please contact customer support for more information or additional assistance.